We are Authorised Dealer, Distributor and Supplier of Masking Tapes and our set up is situated in Aurangabad, Maharashtra, India. 3M™ Crepe Masking Tape Heavy, thick, crepe paper backing provides good paint lines Natural rubber adhesive offers good, instant adhesion Adhesive offers excellent holding power for reliable performance Offers good transfer resistance for clean removal Easy-to-tear design provides simple application 3M™ Crepe Masking Tape 202 is a trustworthy, go-to tape tape designed with a heavy, thick, crepe paper backing. Engineered with a natural rubber adhesive, this everyday tape features good, instant adhesion and strong holding power, which makes it a favorite among teachers for their classroom settings. 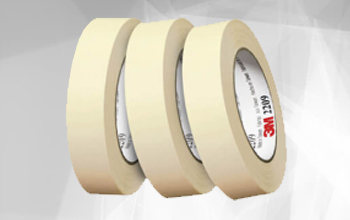 Immediately recognizable, 3M™ Crepe Masking Tape 202 is a high performance tape that's especially good for holding, protecting, bundling and more. Constructed with a heavy, thick, crepe paper backing, this masking tape is reliable and easy to handle. This crepe paper masking tape is also designed with a natural rubber adhesive for good, instant adhesion and excellent holding power. Easy to tear and simple to apply, 3M™ Crepe Masking Tape 202 also has good transfer resistance for clean removal, which has made it a staple in classrooms.